The Truth About Whitening: Is Professional Teeth Whitening Really Better? In America, we spend well over one billion dollars every year on over-the-counter (OTC) teeth whitening products. This is a tremendous amount. The section of the grocery store for teeth whitening has a baffling variety of toothpastes, gels, and strips. Do these products really work? At Pelican Landing Dental, we are proud that our new blog is a venue for dental and oral health education. Today we would like to discuss teeth whitening. If you have further questions, feel free to click here to contact us or call us at (239)449-6104. We hope you learn something and enjoy! Before we compare the two types of whitening systems, we believe it would be beneficial to discuss the whitening process itself. Teeth become stained for many different reasons. First, as we age our teeth generally become darker. This can occur simply from the normal everyday activities over many years. Teeth can also be stained from different foods and drinks. For example, drinking wine and coffee typically can make teeth darker in shade or discolored. Other habits like tobacco use can stain teeth significantly. These are all examples of extrinsic stains. These types of stains occur mainly in the outermost layers of the teeth and can benefit greatly from teeth whitening products. Intrinsic stains, by contrast, generally come from the inside of the tooth and visibly darken the appearance. Examples of this are discoloration from the use of certain antibiotics during development or hemorrhage from trauma. These stains are less frequent and can be much more stubborn. Teeth whitening uses primarily hydrogen peroxide or carbamide peroxide. These products find their way through the complex matrix of tooth structure. From there they initiate an oxidation reaction. This reaction makes the tooth structure reflect light differently thereby giving it a lighter shade. Although the concentration can differ significantly, over-the-counter whitening products generally contain the same or similar whitening agents as professional products. There is one main advantage of OTC whitening agents. These products are inexpensive. Some products can be purchased for just a few dollars. If someone desires minimal results for minimal cost, this is a viable option. These products contain a much higher concentration of the whitening agent. As a result they are more efficient and effective. Results often can be realized with these products that never can be attained with OTC agents. Special trays are fabricated by your dentist to hold the whitening gel. The significance of this cannot be understated. These trays are adapted perfectly to the teeth. This allows for an even application of the whitening gel. OTC products are unable to deliver these even results. Supervision during whitening is important. Your dentist has special training that allows them to best understand and educate about timing, techniques, and stopping points. In addition, restorations like crowns and composite fillings do not whiten like natural teeth. The dentist can help identify these areas and determine the best course of action. Finally, the dentist can identify teeth that cannot be whitened and prevent an uneven appearance as a result. Stubborn stains can be eliminated or reduced better with the higher percentage of whitening agent. 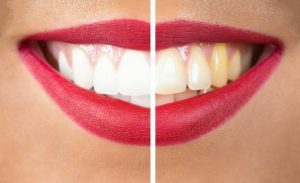 For those that do not want to spend time and effort at home, in-office whitening is advantageous because teeth can be whitened several shades often in one appointment. We commonly treat patients that would like immediate results with the in-office whitening. If you have any questions, feel free to contact us at any time. We would be happy to discuss your specific situation!